This week the gang encounters opposition from all sides, including their very own S.H.I.E.L.D. director as things finally come to a head with Lucy the ghost and her insidious plan. Also, we get Ghost Rider's origin story--are there really two of them?! Let's dig into this intense episode! ★ The scenes with Robbie and Gabe were well-acted and well-written. It was really good to see Robbie come clean, both with Gabe and the audience. ★ Honestly, though, it was amusing when Gabe thought Robbie was a secret agent. ★ Coulson. 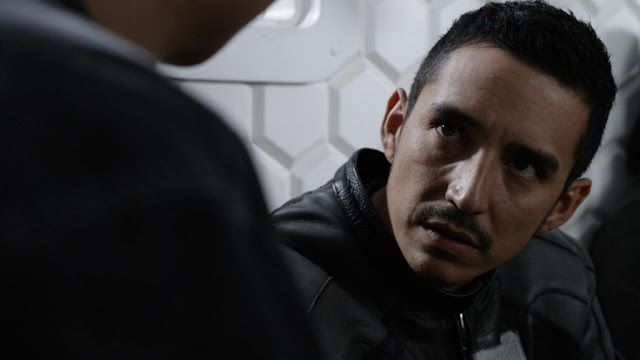 For some reason, he was really exciting for me in this episode--probably because he took the reins back a little bit, reminding us of the S.H.I.E.L.D. director Coulson we all know and love. ★ Oh, and the Star Wars references were perfect. ★ I feel like I'm somehow wrong, but I really don't like Jeffrey Mace after this episode. Especially after he sent Jemma off to who-knows-where. ★ Eli Morrow was one of my favorite secondary characters, so I'm disappointed he went bad. I am personally offended. ★ This episode's pacing was a bit off to me, and I feel more disgruntled by the questions at the end of this episode than usual. I'm usually intrigued, but this week the intrigue has morphed into frustration because I just want to know! ★ Also, I dislike that we have to wait until November 29th for another episode. Robbie Reyes and Coulson were the highlights of this episode, which was by all means not a bad one. Though it's not my favorite of this season, it had amazing CGI, well-written backstories, and plenty of wit to go around. I definitely look forward to the next installment, which will air on a ridiculously late date of November 29th. Until then, fellow S.H.I.E.L.D. agents! Have you seen "The Good Samaritan"? What did you think of it?